Step 1. Make 18 chocolate cupcakes. Step 2. Divide one packet of white icing into three portions. Tint one portion red, one blue and leave the third portion white. Take the remaining packet of icing and tint yellow. Step 3. Roll out the yellow icing and cut disks using the small cookie cutter. Place a disk on each cupcake. Step 4. Roll out the remaining coloured icings and cut 6 large disks from each colour – one to cover the top of each cupcake. Use a pen lid to stamp out eye slots and neaten edges by trimming with a sharp knife. Step 5. Place icing disk over the yellow layer on each cupcake and smooth over with your hands. Step 6. 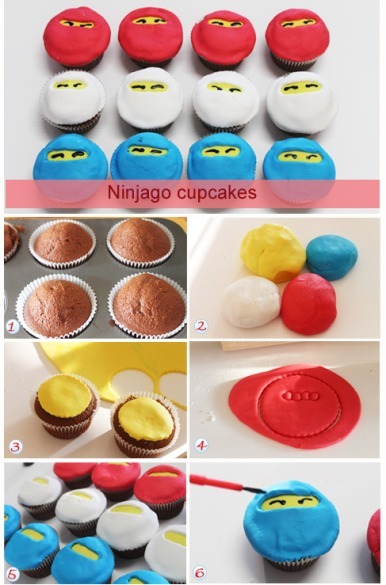 Take a small paintbrush and use the black food colouring to paint eyes on each cupcake. Don’t fear the icing. To add the colouring I just make a dent in the surface and place a few drops in. Then I fold the icing over and over until I have the desired colour evenly spread throughout the icing. If the icing gets a bit too sticky you can sprinkle a little icing sugar on the bench and your hands to dry it out. If the icing is firm you can place it in the microwave for 30 seconds to soften it before adding the food colouring.